Only those candidates who possess the qualifications prescribed under A.P. State Judicial Service Rules, 2007 and the qualifications as indicated below, as on the last date, stipulated for submission of applications, shall be eligible to apply. A. Direct Recruitment: Candidates Must posses a Bachelor’s Degree in Law, awarded by any University established by Law in India. B. Recruitment by Transfer: Must possess a Bachelor's Degree in Law` awarded by any University established by Law in India. Confirmed members or approved probationers in the categories named here under are eligible to apply for the vacancies earmarked for Recruitment by Transfer. i) Section Officers, Court Officers, Scrutiny Officers, Accounts Officer, Court Masters, Personal Secretaries to Judges, Personal Secretaries to Registrars, Translators and Deputy Section Officers, Overseer, Assistant Section Officers, Computer Operators, Assistant Librarian, Assistants, Readers, Examiners, Telex Operator, Telephone Operator and Typists of the High Court of Judicature at Hyderabad for the State of Telangana and the State of Andhra Pradesh. 1. An applicant shall be a person who has not completed the age of 35 years as on 1-2-2018 for Direct Recruitment. Provided that the upper age limit of 35 (thirty five) years is relaxable by five years in respect of the persons belonging to Scheduled Castes, Scheduled Tribes and Backward Classes. Provided further that the uppel age limit of 35 years is relaxable by 10 years in respect of Physically Handicapped persons [Orthopaedically Handicapped) (Lower portion of the body]. As per Rule 7 of A.P. State Judicial Service Rules, 2007, Physically Handicapped [Orthopaedically Handicapped (Lower portion of the body] persons alone shall be entitled to apply. Provided further that in the case of an applicant who served in the defence services of the Indian Union and who is otherwise qualified and suitable, the period of service rendered by him in the defence service, shall be excluded in computing the age, for appointment by direct recruitment. 2. An applicant for Recruitment by Transfer shall be a person who has not completed the age of 48 years as on 1-2-2018.
b) written examination shall carry 80 marks ..
c) Viva Voice, which shall carry 20 marks. - Candidates who are qualified in the Screening Test, if held, shall be short-listed to the level of 1: 10, of the available vacancies in each category; in the order of merit, conferring eligibility upon them, to appear in the written examination. The marks obtained in the screening test shall not be added to the marks obtained in the written examination and they shall not be counted for determining final order of the merit of the candidates, as the screening test is conducted for the purpose of short listing the candidates. - The Questions in the examinations shall be answered only in English. b) Procedural Laws comprising of Civil Procedure Code, Criminal Procedure Code, Evidence Act, Civil Rules of Practice and Criminal Rules of Practice, will be tested. In the Viva Voice, the academic knowledge of a candidate, his communication skills, his tact and ability to handle various situations in the Court, will be tested. a) Only such candidates who secure 40% marks (for OC category), 35% (for BC category), and 30% (for SC and ST categories), in case of direct recruitment, shall be treated as qualified in the written examination. b) In case of the candidates for Recruitment by Transfer, the qualifying marks are 40%, in the written examination for O.Cs and B.Cs, and 30% for SC/ST candidates. Applications are invited through ONLINE for General Recruitment to 26 posts of Civil Judge in the State Judicial Service, comprising of 21 vacancies to be filled under Direct Recruitment, and OS vacancies to be filled under Recruitment by Transfer. The application will be available in the official website of the High Court "hc.tap.nic.in" FROM 4.10.2018 to 3.11.2018. The Last date for submission of Online Application is 3.11.2018 upto 11.59 p.m. The Hand written/ Typed/Photostat copy/Printed Application Form will not be entertained either directly or by Post or by Courier or in person. As per the revised pay scales which came into effect from 1.1.2006, the Scale of Pay of the post of Civil Judge is Rs.27,700/- to Rs.44,770/-. AP High Court Hall Ticket 2018 – Civil Judge (Junior Division) Screening Test Hall Ticket: The Screening Test in connection with the recruitment to 26 posts of Civil Judge (Junior Division) notified for the year 2018 in the State Judicial Service will be held on Sunday the 18th day of November, 2018 at the notified venues. Original Hall Tickets are dispatched to the candidates. If any candidate does not receive the Hall Ticket he/she can download the hall ticket from the official website of High Courtonwards. by clicking on the same, a page containing the brief subjects will be displayed. 5. And thereafter the computer generated Hall Ticket appear on the screen which has to be downloaded and has to obtain a print of the same. 6. Thereafter, the candidate has to affix his/her passport size photo on the down loaded hall ticket duly signed by him/her, and got attested by a Gazetted Officer and appear for the Screening Test. The High Court of Judicature Hyd has announced the results of the examination of the junior civil judge (JCJ) posts in the lower courts of Telangana and AP states. Under the Direct recruitment and transfer recruitment quota. They will be conducting oral examinations on the High Courts premises on 27th and 28th of this month. The High Court registrar orders were issued to this extent. Written examination was held on 26th November last year, according to JCJ 2018 notification. 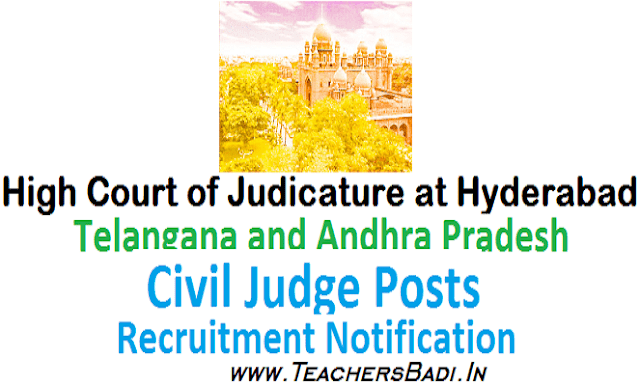 The candidates with the following hail ticket numbers are qualified in the written examination conducted in connection with the recruitment to Civil Judge (Junior Division) in the State Judicial Service by direct recruitment and recruitment by transfer, and they are required to attend the oral interviews to be conducted on ... and .. in the High Court of Judicature at Hyderabad. Call letters are being sent to the candidates by registered post with acknowledgement due/Speed Post. Step 2: On opening the Official website page, on right side, there will be the "latest notifications" blinking, by clicking on the same, a page containing the brief subjects will be displayed. Step 4: Download the Results PDF File. This is not Notification inviting applications, its just to notify that there are 59 vacancies in the cadre of Junior Civil Judge, it is common practice for high court to notify the vacancies before issuing actual notification inviting applications. the information regarding last date is completely false, please do not misguide the applicants. we request you to take down this information otherwise we are going to initiate a complaint against this website. Sir,I had a query,can the students who are pursuing Law Final year is eligible for this notification..? Yes we are eligible for JCJ notification . sir,i had one doubt,is the jcj notification released? sir,i had one query,is that jcj notification released? The application form is not on the high court website. Please can you provide a link for the application forms?